On the 7th of November Russia recognized(I don’t say celebrate because I don’t know that people were, in fact) the 90th Anniversary of the Mighty October Revolution(which would be considered the Mighty November Revolution according to our calendars). With all of the changes that are taking place in Russia today, and the threat of more political instability on the horizon, many Russians spent the day contemplating their “mighty” history. Lenin’s plans were mighty, but the system was not. Ask any aged Russian on the street Moscow about whether they prefer communist life or “democratic” life, and they will most likely shake their head in disgust and refer to the good ole days nostalgically. The west, at any given moment, has a plethora of bones to pick with communism, but do we give it enough credit for the good that it did do. The old people on the street seem to think that communist living was much better, they didn’t have to worry about tomorrow. And now, even though the 7th of November is supposed to be a day of celebration, many of t hese pensioners consider it a day of mourning for the promises of security that were never realized, a day when they question all that they knew to be mig hty and sure. So I choose to humor these nostalgic communists on their holiday. Today we will try and think not of 90 years of oppression and corruption, but of development, work, and purpose. The first thing that comes to mind when I think of good things that communism did for the country is the educational system. I studied in Moscow for a year under teachers who were educated in pedagogy in the Brezhnev era. They took such pride in their work, they cared for their students, they spent extra time to make sure that the students were reaching their full potential. Students are celebrated and take their work very seriously. 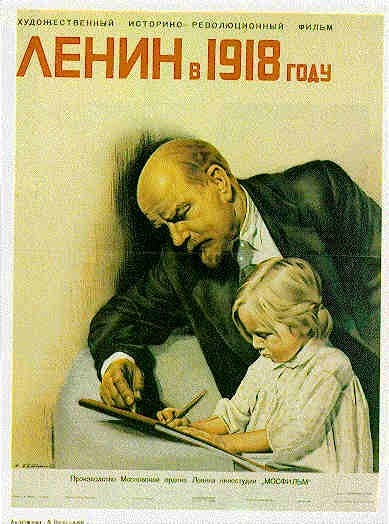 I can only imagine how much more invigorated with zeal and excitement students(pioneers, as they are called in Soviet times) must have been when they felt like their education was a mighty contribution to the mightiest of institutions, that they, themselves, could make old Uncle Lenin proud. “The Three Chief Enemies In my opinion, three chief enemies now confront one, irrespective of one’s departmental functions; these tasks confront the political educationalist, if he is a Communist—and most of the political educationalists are. The three chief enemies that confront him are the following: the first is communist conceit; the second—illiteracy, and the third—bribery. A member of the Communist Party, who has not yet been combed out, and who imagines he can solve all his problems by issuing communist decrees, is guilty of communist conceit. That is only communist conceit. The point is to learn to impart political knowledge; but that we have not yet learnt; we have not yet learnt how to approach the subject properly. -The Second Enemy—Illiteracy As regards the second enemy, illiteracy, I can say that so long as there is such a thing as illiteracy in our country it is too much to talk about political education. This is not a political problem; it is a condition without which it is useless talking about politics. An illiterate person stands outside politics, he must first learn his ABC. Without that there can be no politics; without that there are rumours, gossip, fairy-tales and prejudices, but not politics. В жизни цель – прекрасна и светла. Our goal in life is bright and beautiful. We’ve got important work to do, guys. Вместе с комсомолом – навсегда! There are new roads ahead. Ah, Lenin would be so proud. Communism brought with it an abundance of these abbreviated and compounded words, they can somethimes be hard to find in a dictionary, but they’re kind of fun to know. 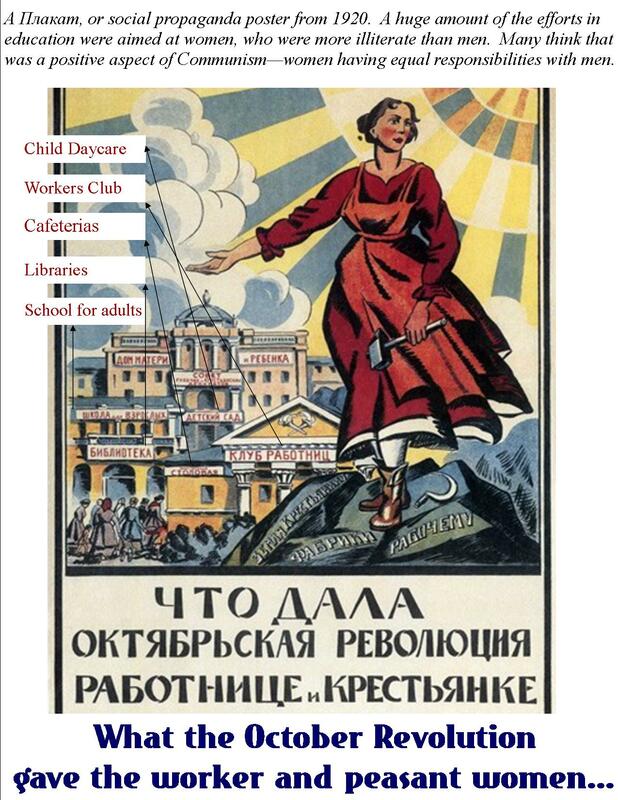 -Ликбез-ликвидация безграммотности, the campaign launched in 1920 to eliminate illiteracy. -Комсомол-Коммунистический союз Молодежи, Communist Youth Group,kind of like scouts but more intense. I fear that I disagree on some points. Firstly, we in the diaspora do not say that everything that happened during the Soviet period was evil. You did read the post on my site regarding General Dovator? Therefore, you know that I am not a mindless hater of all things Soviet! What many Westerners are unaware of is the fact that Russia in the early decades of the 20th century was the fastest growing country in Europe (if not the world). Much work was done to extend education in the countryside, and the Soviet efforts to combat illiteracy were only a continuation of that. Another example was the work of the zemstvos (local governing authorities) in bringing medical care to the villages. One modern Russian doctor said in admiration, “The zemsky doctors did it all! They always had a roof over their heads and clothes on their backs!” In other words, in tsarist times, many doctors chose selfless service in the provinces, even though it meant a life that was not as remunerative as a career in the urban centres. I fear you shall not agree with the following. Lenin, in the eyes of many, was not a good man. I agree with this assessment. The bloodshed of the imposition of Bolshevik rule cannot be denied. Many of us in the diaspora have relatives in their bloodlines who were murdered by the Cheka and its successors. That is why it took so long for the Orthodox Church in the diaspora and the Church in the rodina to come to reconciliation (which they did on 17 May of this year). I believe that President Putin is taking a correct course in his assessment of the Soviet times. He refuses to denounce the good that was done, and he refuses to cover over the evil of the repressions of that time. Vladimir Vladimirovich was correct in saying of the collapse of the Soviet Union, “He who does not regret the fall of this system has no mind, and he who does regret the disruption of the nation has no soul”. In short, this is a very complex topic, that can be all too easily misunderstood. I apologise if my opinion of Lenin pains you. Know that I would be as respectful of your opinion on my site. As an Orthodox Christian, and as a person of Russian descent, I consider the Soviet era as equivocal at best. Nevertheles, I shall never deny what history has shown us, for if we do so, we are mindless beasts doomed to repeat every mistake of the past (with interest, I might add). Thank you so much for your insightful comments on my blog! I loved it! I love the disagreement. I really value your input and point of view. That is what makes Russian history so fascinating, is that their are so many opposing oppinions and its hard to get solid facts from both Russian and American books. I realize that my tone probably came across as anti-soviet, which it wasn’t, and it wasn’t supposed to be pro-soviet either. Americans have a tendancy to immediately assume that communism entailed only oppression and dictatorship, and they fail to recognize the good things that came of it. Literacy and the educational systems were one of the wonderful things that communism engineered. There are many areas in which America does not give USSR enough credit. I always try to help Americans see Russia not through their American lens, but through a Russian’s lens. I don’t think that Americans realize how many people in Russia, (ages 40+) would sacrifice free speech any day to be able to go back to the stable times of communism. I am really fascinated with a lot of facets of the Orthodox church, especially the details of what happened to it during communism. I would love to feature you on one of my posts. Can I consult you with my questions once I get them? I am loving your blog. It is so beautiful and I feel peace and beauty in my heart when I read it. Thank you for portraying Russia in such a beautiful and spiritual light. I’ll make a link to your blog on mine so that people can know the source of all the insightful disagreements. Feel free to come visit and disagree all you want!